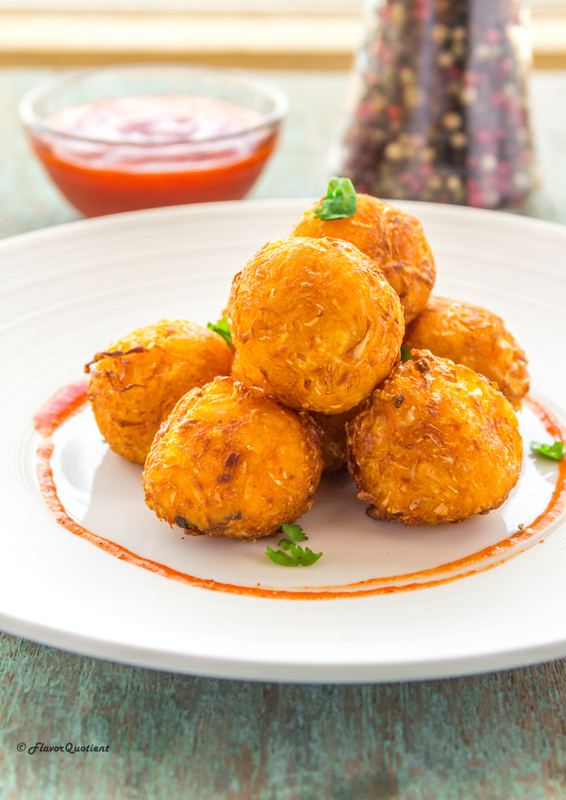 The healthy vegetable given a tasty makeover in this crispy cabbage fritters! They not only look cute but also tickle your taste buds! I know what you must be thinking! Too many fritters recently, right! Zucchini fritters, cauliflower fritters and now I haven’t even left the cabbage alone! And I am happy I didn’t! 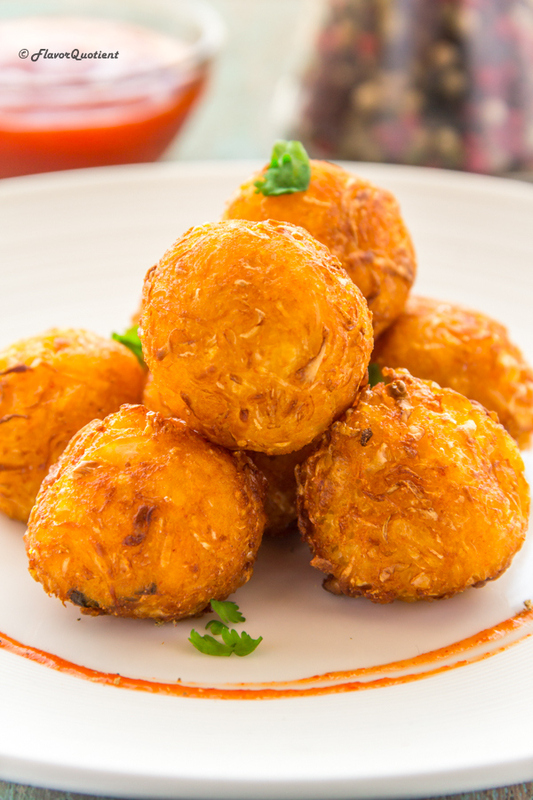 These crispy and crunchy cauliflower fritters are perfect snacks on a drizzling evening. 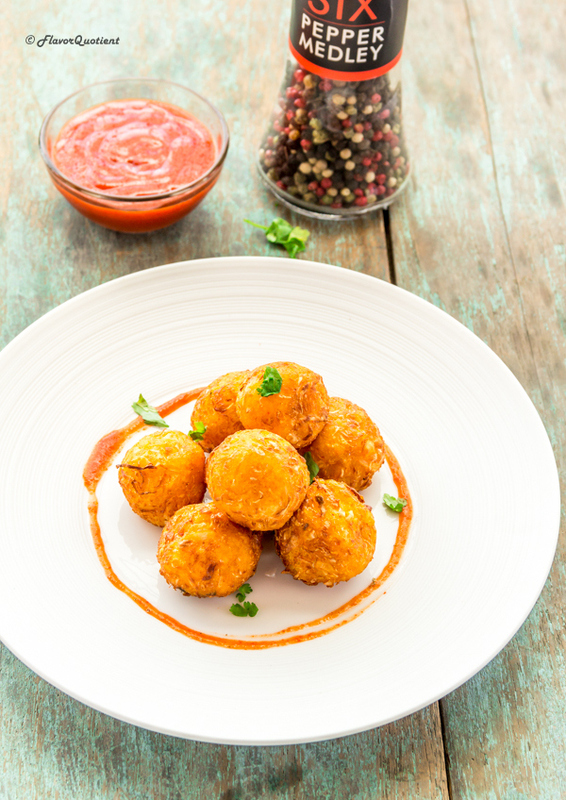 An ideal party snack too; your vegetarian friends will thank you for this in the next gathering! I am sure there are many out there who do not have very high regards for cabbage and let me confess that even I am one of them. I am always on the lookout for innovative recipes with cabbage so that I can include this veggie into our meals. The idea of this recipe came from my dearest hub. He is too fond of fried snacks and was also not too fond of cabbage except of course the spicy cabbage curry. During our trip to supermarket last week, he was enquiring if I can make anything different with cabbage which he can munch on while cheering his favorite soccer club. I paused for few seconds to give a quick thought and then gave a vague nod. Honestly I was not sure at that time if I would really be able to pull something off which will be worth sharing with you all. Thankfully I could! And that’s precisely why this recipe is making its way here. I haven’t and I won’t ever share anything here with my dear readers which we ourselves didn’t enjoy. I know that might sound so obvious but still it’s sometimes nice to clarify things. Isn’t it? 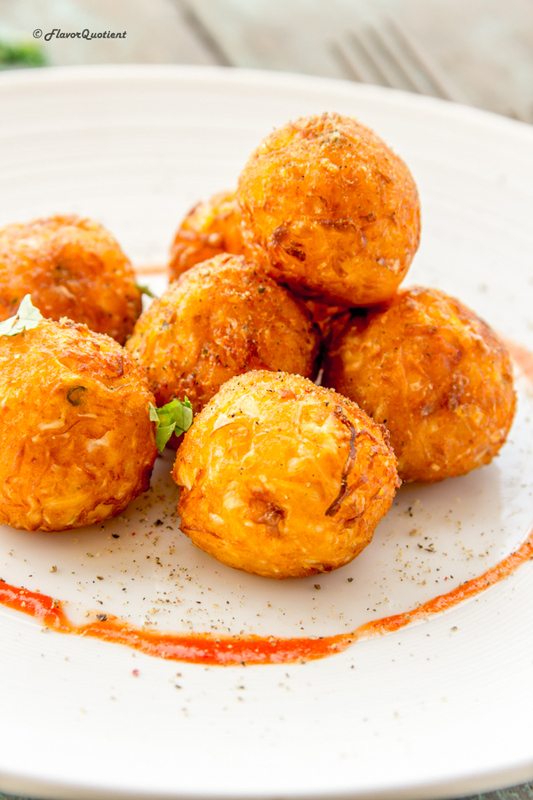 These cabbage fritters turn out to be a crowd pleaser. I used shredded cabbage mixed with mashed potatoes to give them a body and the crispy outer coating was due to one of my favorite ingredients cornflour. 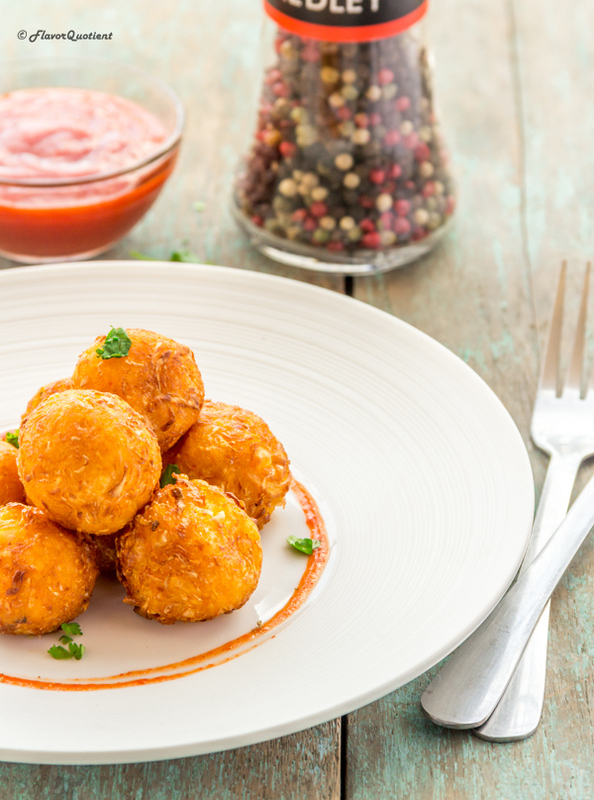 Cornflour can really turn things up, be it soups or stir-fries or crispy fritters! One magic ingredient I must say! 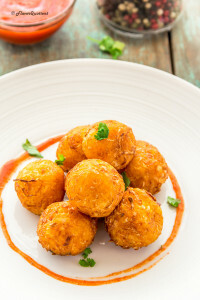 If you want to serve these crispy cabbage balls as a party starter, you can prepare them beforehand and just fry them up once your guests start arriving. Does shredding cabbage sounds dreadful to you especially if you want to serve these to many guests? If yes, then this underestimated (& unacknowledged) kitchen gadget (which is also another love of my life) – the food processor – can really prove to be a life savior for you! Yeah of course you will now tell me that one can’t buy a gadget only to shred cabbage and I completely agree with you! But a food processor is way more than that! I am using the sleek yet sturdy Braun Multi-Quick hand blender with food processor attachment from last couple of years and completely addicted to it! It’s an all-in-one gadget with an immersion blender, a small chopper for nuts and herbs and the primary food processor attachment which takes very less counter space but gives an array of services! Once you check out all the amazing services it offers, you can’t help but fall in love with it! I do all my meat mincing for meatballs, fine and coarse shredding for stir-fries, slicing for salads and more, kneading for breads and pizzas, all kinds of chopping and many more activities using this single machine just in a jiffy! Even if you do or do not love cooking, I would highly recommend to invest in a good quality food processor to help you save time in kitchen. With that I won’t keep you from the recipe any more. The recipe not only looks short and sweet but also is a breeze to make. So next time you buy cabbage against everyone’s wish in your family, surprise them with these cute little balls and I am sure they gonna thank you! Finely shred the cabbage to make 4 cups approximately. Blanch the shredded cabbage in boiling water for 5 minutes. The cabbage should be almost cooked but still retain a crunch. After 5 minutes, rinse the cabbage under cold water and put in a colander to let the water drain out. Then wrap the cabbage in a kitchen towel and squeeze out as much water as possible. 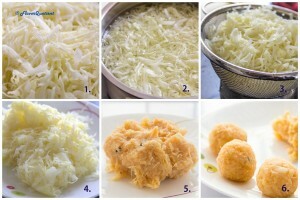 Put the dried cabbage in a large bowl and add all the other ingredients. Mix everything thoroughly. The mixture will be dry at this point. Add 1 tablespoon of water at a time and incorporate it. Add only that much water until you get a sticky dough. Make small round balls of 1 inch diameter and set aside. Heat enough oil in a deep frying pan. Dee fry the cabbage balls on medium heat until golden brown. Put on an absorbent paper to soak excess oil. Serve hot with hot and spicy ketchup! 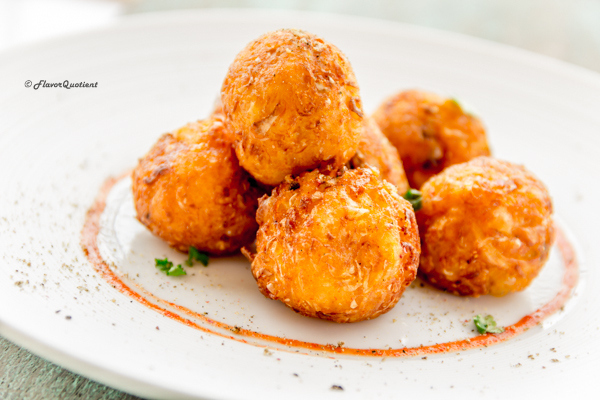 I think even the cabbage haters would love these crispy fritters…lovely! Thanks! I am so glad you liked it!